I've asked a question about packaging. I was compiling multiple depending libraries into one static, and was wondering if there was a smarter and systematic way to determine compatible versions rather than just trial & error. I left a comment saying that I'm doing packaging from my profession as sysadmin, and asked what would have been a better stack exchange site to post my question, but I never got a reply. I'm certainly not impatient or looking to violate any stackexchange rules, I'm just genuinely looking for the right way/place to ask about this. I'd like to put up another candidate. So the question would seem to be entirely appropriate there. Also, there are some brilliant unix people there from whom I've learned a lot, so I'd give it a reasonable chance of getting a good answer. 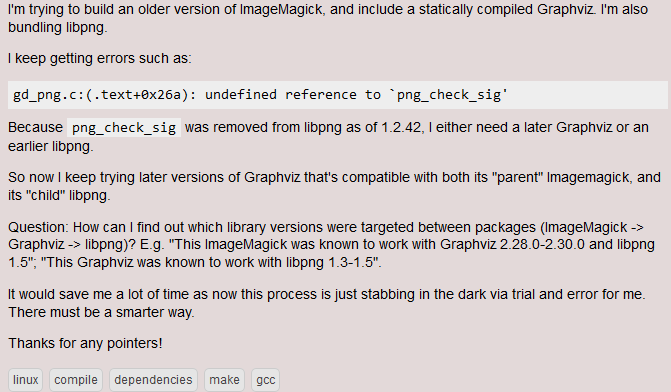 Your question is actually about compiling code and dependencies thereof, not packaging the results of the compilation. For me, this puts it firmly in SO's realm. The people there deal with compilation etc on a daily basis, as a sysadmin I might do it occasionally. They are more likely to be able to help than we are.